SAN DIEGO — Ten years ago, the average gram of meth available in the U.S. was 39 percent pure. Today, it is being sold in a nearly pure state, manufactured in Mexican “superlabs” and smuggled across the border to feed an epidemic of addiction. The drug is being peddled alongside fentanyl, a synthetic opioid 50 times stronger than heroin, and carfentanil, an elephant tranquilizer that can kill a human with just a speck or two. The purity and potency of the illegal — and in some cases legal — drug market has seemed to reach new levels. It is a trend that is particularly alarming to authorities as it unfolds against the backdrop of an emerging opioid crisis that has taken an unprecedented number of lives and touches all walks of life. Drug poisoning deaths are the leading cause of injury death in the U.S., surpassing car crashes, suicide, homicide and guns. It begs the question: Just how much stronger can drugs get? That could depend on how the opioid crisis pans out, as there are indications that the craving for prescription highs and the introduction of fentanyl into the illegal market have changed appetites. “I’ve got to believe that the higher potency is to compete with the higher potency of other drugs available on the market,” said Rosalie Liccardo Pacula, director of BING Center for Health Economics and a drug policy expert with the Rand Corp.
With the stakes higher than ever, Amy Roderick, spokeswoman for the U.S. Drug Enforcement Administration in San Diego, hopes the public is taking notice. 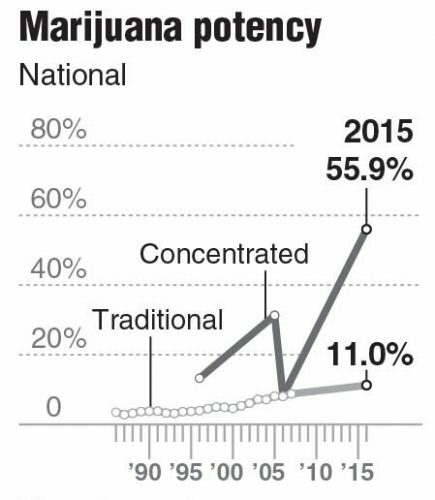 Here’s a closer look at substance potency levels over time and the current marketplace. Marijuana has gotten increasingly stronger over the decades as the demand for designer crops has grown, the drug is decriminalized around the country and innovation flourishes. It’s a phenomenon tracked in part by the University of Mississippi’s Potency Monitoring Program, which tests law enforcement seizures from around the nation. Mexico is the primary foreign source for marijuana, although marijuana is being grown increasingly in the U.S. as it is legalized in many states. While Mexican marijuana is thought to be lower grade, law enforcement reporting indicates cartels are increasing the quality to stay competitive, according to the DEA. Traditional marijuana flower averaged a THC potency of 11 percent in 2015 — three times the amount in 1995, according to the seizure data. (Potency is the dosage needed to affect a person, versus purity, which is the amount of drug in a sample.) The highest level of THC tested was 37 percent. Marijuana concentrates, known as butane hash oil (BHO), shatter, butter, rosin and other names, is incredibly more potent, with a national average of 56 percent purity in 2015, according to the university’s seizure data. Concentrated marijuana is found in vaporizers, edibles, tablets and lotions, and is how many new or experimental users might experience legalized recreational marijuana. Some hash oil seizures tested above 90 percent potency, the university reported. The legal market shows even higher typical potency levels — 20 percent in traditional marijuana and 60 percent in concentrate being commonplace in Washington state, according to a 2017 study by Rand. Potential users in legal states need to remember that this isn’t the same weed they smoked in college, experts say. “The purity is so much higher and you run the risk of ending up hurting yourself,” Roderick said. Pacula at Rand is part of a group of experts working to identify standard doses of marijuana that can be recommended in its various forms — an area of research lacking in the U.S. due to marijuana still being illegal under federal law. When U.S. laws restricted the sale of precursor chemicals needed to make methamphetamine, its production moved from domestic home labs to massive labs in Mexico run by cartels. But consumption of the drug has kept a strong foothold in the nation and San Diego County. The drug is being sold in nearly pure form these days. Purity in 2016 was around 93 to 96 percent with prices low and stable, indicating an oversupply, according to the DEA’s 2017 National Drug Threat Assessment. A 93 percent pure gram was going for $58 in 2016. To counteract the falling prices, organizations are trying to market more to the East Coast and hook new users, authorities said. The Mexican labs are also coming up with new methods to make the drug so they don’t have to rely on getting precursor chemicals from China, a supply chain that is being heavily scrutinized, the DEA reported. Survey and treatment data shows demand for meth may be increasing. In San Diego County, deaths, reported usage and reported availability all rose over the past five years, according to the Methamphetamine Strike Force 2016 Report Card. Fentanyl, a prescription drug that has been around for decades, has been used as a painkiller and anesthetic in clinical settings. Most of the fentanyl in the U.S. illegal market is either being made in Mexican cartel labs or is being mailed in much smaller quantities from China. It is not complicated to cut fentanyl into other drugs or make into pills, which can be especially deadly to users in the hands of an amateur mixologist. It is cheaper and easier to produce than heroin, which is produced from poppy crops, and is often deceptively marketed on the street as heroin or oxycodone pills to opioid addicts. The fentanyl being seized coming across the U.S.-Mexico border in San Diego is typically 4 to 6 percent pure, already diluted considerably by the cartels, said Roderick. The smaller quantities being mailed from China are much more pure, often 90 percent or higher, according to the DEA. A wholesale kilogram of fentanyl in San Diego County goes for about $31,000, Roderick said. The prices increase the farther from the border. “We’re seeing more fentanyl than any other DEA lab in the country due to the fact we are at the border,” said Roderick. Heroin in San Diego County comes exclusively from Mexico, and with boosts in farming production there, the country is now the primary source of heroin for the U.S. Lab tests show Mexican powder heroin is extremely pure, especially on the East Coast, more than the typical 40 to 50 percent dilution in that market, the DEA reported. In San Diego in 2015 heroin was testing 35 percent pure, continuing an upward trend over the past few years. Mexican black tar heroin, which has traditionally been the heroin of choice in San Diego, has also been increasingly replaced by refined white or brown powder heroin — another result of the opioid epidemic. A designer drug marketed as “China White,” a name that used to mean heroin now means fentanyl or perhaps an even stronger fentanyl derivative. “The illicit fentanyl and heroin markets are so intertwined it is difficult to gauge how much heroin market share fentanyl has gained,” the DEA stated in its 2017 assessment. Cocaine appears to coming back into fashion after its 1970s and ’80s heyday. Opioid addicts have been drawn to the drug recently, she said, and “speedballing” — mixing heroin and cocaine to balance the stimulant and depressant effects of the drugs — is becoming more popular again. Coca production has been increasing in Colombia in recent years with the end to aerial fumigation and a financial incentive program promising to pay farmers for their illicit crops if they turn to legal ones. While the average purity of a gram of cocaine in the U.S. has remained relatively stable in the past several years — around 45 to 49 percent — it increased to 56 percent last year. The price has dropped since then, to $165 per gram.